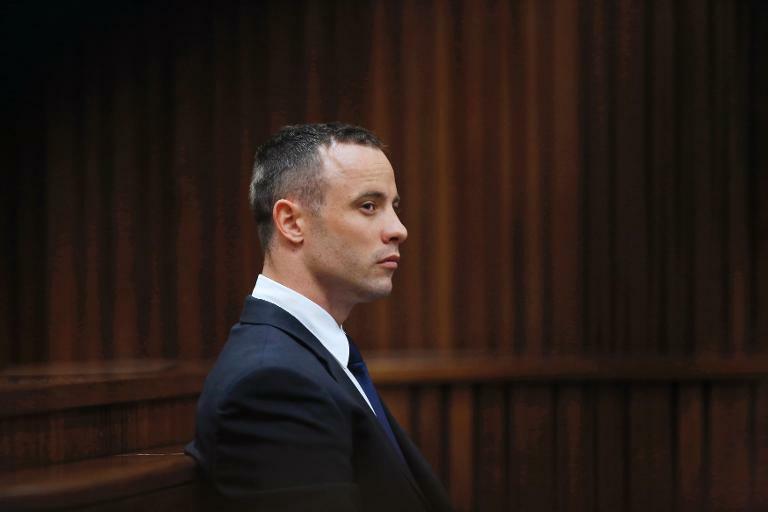 FILE PICTURE: South African Paralympic sprinter Oscar Pistorius sits in the dock during the testimony of a defence witness at his murder trial at the high court in Pretoria on May 6, 2014. Picture: AFP. The seventh week of Oscar Pistorius’ murder trial proceeded swiftly last week, despite being delayed by election day on Wednesday with five neighbours, an anaesthesiologist, a social worker and a ballistics expert testifying in his defence against a charge that he had murdered his girlfriend Reeva Steenkamp. * The fourth witness for the defence, Oscar Pistorius’ neighbour and friend Johan Stander testifies that he looked after Pistorius’ dogs when he was overseas, but says they were friendly and not aggressive. He says he woke up at 03h19 on 14 February last year when Pistorius phoned him, begging him to come to his house and telling him “I shot Reeva. I thought she was an intruder”. He and his daughter Charise rushed to Pistorius’ house where they found Pistorius carrying Reeva, who had a head wound, downstairs. He looked relieved when they arrived. He asked them to help him get Reeva in the car to take her to hospital, but his daughter asked him to put Reeva down. Pistorius was broken, screaming, praying. Stander went outside to call an ambulance when another neighbour Dr Johan Stipp arrived. He told Stander he had heard four shots, silence, screams and four shots. Stander says he interpreted what Pistorius said as that he had made a mistake, although he never used those words, but denies trying to help Pistorius. He would not like to experience seeing Oscar like that again – broken, desperate, trying to save Reeva’s life. He says he saw the truth there that morning. * His daughter Charise Viljoen becomes emotional when she testifies how frantic Pistorius was, screaming that he wanted to get Reeva to a hospital. She asked him to put Reeva down so that they could see what was wrong. There was blood everywhere. She tried to help Pistorius to stop the bleeding with towels and plastic bags. He had his hand in Reeva’s mouth, his hand on the wound in her hip while praying for God to save her life and begging Reeva not to leave him. She feared Pistorius was going to shoot himself when he went upstairs to fetch Reeva’s handbag after the paramedics arrived and declared her dead. *’Civil engineer and Pistorius’ closest neighbour Mike Nhlengethwa testifies that Pistorius introduced Reeva Steenkamp to him as his fiancee and told him he was moving to Johannesburg to be near her when he met Reeva for the first time the weekend before her death. He told Pistorius she was a keeper after she opened her arms and hugged him on first meeting him. He says his wife woke him up early on February 14, asking if he had also heard a bang. He went to check the house and on returning to his bedroom heard a man crying very loudly as if he was in danger, saying “no, please, please no”. He phoned security before going to Pistorius’ house where he saw Pistorius crying and kneeling next to a lady on the floor. There was blood all over and Pistorius was begging another neighbour, Dr Johan Stipp, to help him, but he could see things were very bad. He knew the lady was dead when the paramedics went in but came out with their stretcher after a short time. He did not hear shots or a woman screaming. * His wife Eontle Nhlengethwa testifies that she woke up because of a loud bang. While her husband went to check the house she heard a man crying “help, help, help”, followed by man crying loudly. She never left her room and did not hear any shots or a woman screaming. *Rika Motshuane, another close neighbour, testifies that she heard a man crying as if he was in pain that morning. She and her husband were scared and panicked, so they stayed in their room and tried to go back to sleep after her husband phoned security. She never heard shots or a woman screaming in terror. * Prof Christina Lundgren, head of Wits University’s anaesthesiology department, testifies that gastric emptying is not an exact science and it is not a good idea to pinpoint when Reeva Steenkamp had her last meal based on the contents of her stomach. She says numerous factors can delay gastric emptying, including sleep, the type and quantity of the meal, alcohol, smoking, medication, medical and psychological disorders such as anorexia and diet herbal medicines. It is generally accepted that in a normal individual ten percent of a low fat meal would remain in the stomach after four hours. She concedes there’s nothing to suggest that Reeva was not a normal individual. She says many anaesthesiologists had experiences where food could remain in the stomach even after eight hours. She respects state pathololgist Dr Gert Saayman and he’s entitled to his opinion but one cannot categorically state that the stomach would have been empty after six hours. She concedes she is not a pathologist and is not aware that digestion continues after death. * Government social worker Yvette van Schalkwyk, who was appointed to support Pistorius emotionally after his arrest, says she decided to offer her evidence because media reports that Pistorius had acting training and was not sincere upset her. She testifies that Pistorius was crying and heartbroken about losing Reeva and the suffering he caused her parents from the moment she met him. She says Pistorius dealt with his emotions by regular sessions with a psychologist, including art therapy. She says in cross-examination Pistorius told her he had shot Reeva by accident but concedes that he never said he was sorry he shot her. She does not agree that it was all about himself. She denies feeling sorry for Pistorius and says she has empathy with him. *’Private ballistics expert Tom “Wollie” Wolmarans criticises the manner in which the police handled the crime scene, including the removal and reconstruction of the door. He found a bullet fragment and piece of tile inside the toilet bowl after the police had completed their investigation. He says many factors could have influenced the conclusions about the trajectory of the bullets, including deflections caused by the probes and the inaccurate reconstruction of the door. He disagrees with the police’s ballistics expert Capt Chris Mangena that a fragment from a ricochet bullet had hit Reeva in the back and that she was standing facing the door when she was shot in the hip. He says her arm was between 6cm and 20cm away from the door when she was shot in the arm and she was possibly leaning towards the door when the first shot hit her in the hip. * The police reconstruct a laser used to inspect the bullet holes in the door and Judge Thokozile Masipa and her assessors inspect it while experts use a spray can to make the laser beam more visible. * Wolmarans disagrees with Mangena’s evidence that Reeva had her hands in a defensive position over her head when the same shot hit her in the hand and head. He also disagrees that a bullet fragment hit her in the back and says the bruises on her back were caused by a fall onto a magazine rack in the toilet. He says what happened behind that toilet door no-one will ever know and experts can only speculate about it. He says the sequence of shots as reconstructed by Mangena could have been different because Mangena never took the deflection of the bullet through the door into account. He believes the shot that hit the wall and ricocheted at another point had fallen into the toilet bowl and had noting to do with the injuries on Reeva’s back because the bullet would not have had enough energy and it could not have jumped over her back before it landed in the toilet. He professes the greatest respect for Mangena, who calls him “oom” (uncle) while he refers to Mangena as “my seun” (my son). He never consulted with Pistorius about the incident and says Pistorius left the room and vomited when he unthinkingly produced a photo of Reeva’s injuries. He takes offence when Prosecutor Gerrie Nel accuses him of being biased and says he’s only there to assist the court. He concedes that Roger Dixon, the geologist who testified for the defence, is not a ballistics expert and that he would not accept Dixon’s advice about ballistics. He took Dixon for a beer after he concluded his evidence, but denies that he changed his report because of anything Dixon told him. Like Dixon, he contradicts Pistorius’ evidence that the magazine rack was nowhere near Reeva’s body. Wolmarans was present when sound tests were done with a cricket bat and a 9mm pistol and during decibel tests with Oscar hitting a wooden door with a cricket bat, but says he cannot express an opinion about it because he is not a sound expert, is hard of hearing and has tinnitus (a constant ringing in the ears).